The staple of Italian red sauce joints can be yours at home in under 40 minutes. Thinly pound the chicken breasts for faster and more even cooking, then bread them in a savory coating of bread crumbs and grated Parmesan. 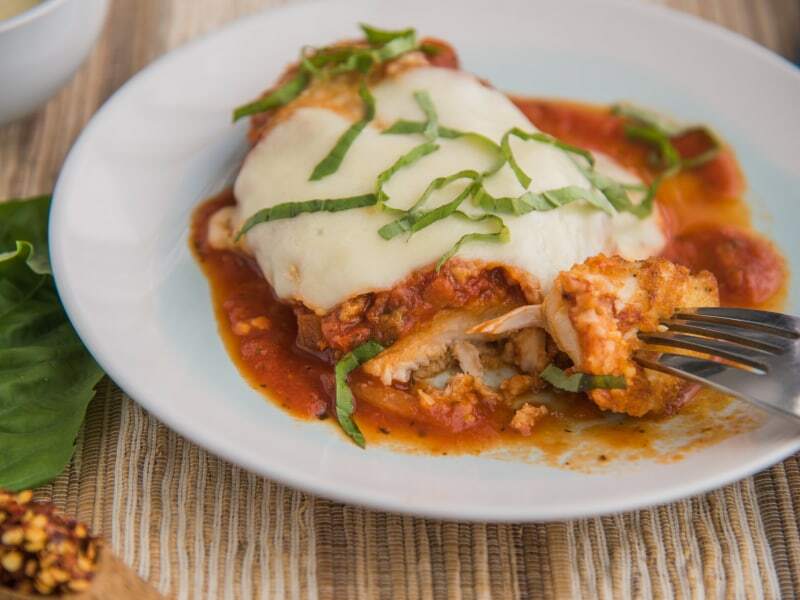 Using a prepared marinara makes quick work of the sauce, and melted mozzarella cheese completes the dish. This recipe is a total crowd-pleaser for both kids and adults—serve it with a big green salad for an informal dinner party, or with cooked fettucine or linguini for an easy weeknight dinner. Don't forget crusty bread to soak up the sauce! Use one hand for dipping in the eggs and the other hand for dipping in the flour and bread crumbs. This will avoid breading your fingers! Gluten free? Use your favorite gluten-free flour in place of the all-purpose, and make your own gluten-free bread crumbs by blitzing a few pieces of Udi's or other gluten-free bread in the food processor until they're in small crumbs. Per Serving: 843 calories; 30g fat; 76.1g carbohydrates; 63g protein; 316mg cholesterol; 1216mg sodium. 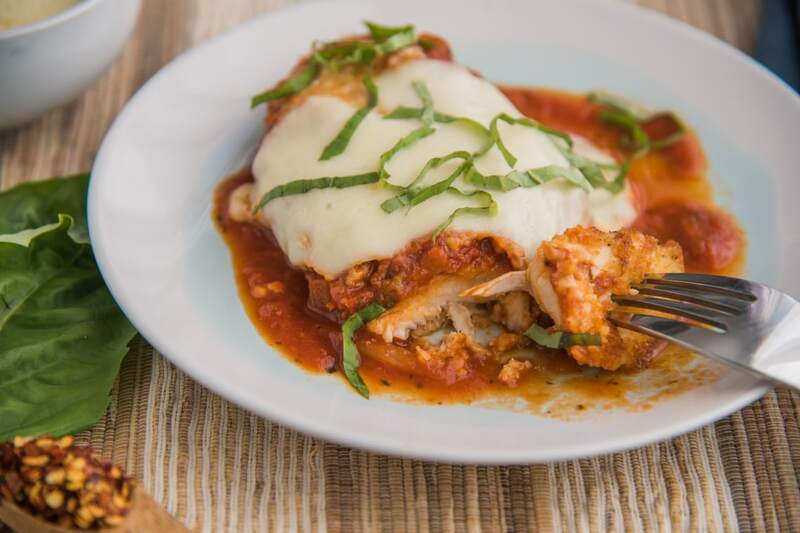 This was an authentic chicken parmigiana recipe, and it was so simple, I can't believe it! The breadcrumb and marinara topping was so delicious, my mouth is watering all over again just thinking about it! No fuss, no frills, just good eating! One of our favorite weeknight meals. I've never considered myself a gourmet chef, but this recipe tastes like something out of a high end Italian restaurant. Very good, very easy. Five stars.